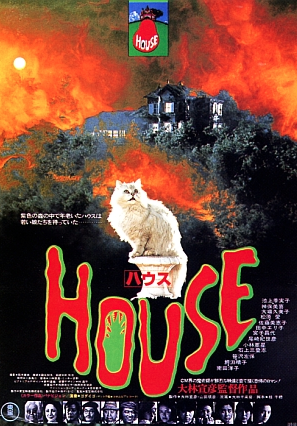 When I first watched House about a decade ago all I knew about it was that it was a Japanese horror film about a house that kills its inhabitants. Applying what I knew about J-horror at the time I went in with a number of expectations almost all of which were immediately smashed. This is a horror movie unlike any you have seen before. The plot is fairly conventional: a group of school girls break for Summer and decide to stay with one of their Aunts in an old country house. When they arrive they find the Aunt to be a somewhat sinister character and soon the house turns on them, dispatching them one by one in a series of grizzly and imaginative deaths. Beyond the plot nothing is conventional. It's as if Sid and Marty Krofft made their versions of Evil Dead 2 and if that sounds appealing to you, this might be your new favourite movie. The film deviates from traditional horror almost immediately. Rather than building to a break in reality the school girl's every day lives are treated like a fantasy. 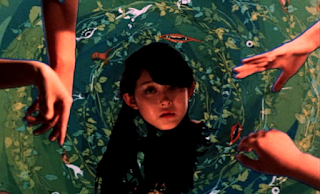 Overt editing techniques such as deliberate jump cuts and iris frames are coupled with stylised design work and intentionally fake back grounds. When our lead, Angel, is introduced to her new Step-Mother it is done so on a soundstage constructed balcony against a fiery painted cloudscape backdrop. When she runs out upset, dropping a handkerchief as she does, the dropped item is pasted, picture-in-picture, into one of the window frames of a door. It is family drama shot like montage. These unusual choices never let up and before we've even got to the house we've had an animated sequence and Svankmajer-esque live-action stop-motion. The movie also veers into comedy a number of times. There is a sequence where a buffoonish character falls down the stairs ending up with a tin bucket stuck to his arse and every time martial arts expert Kung-Fu (all of the school girl characters have nicknames) performs a karate kick she is accompanied by weirdly cheery action music. There is a clearly fake skeleton that comes to life and wanders in and out of frame from time to time, sometimes even stopping for the occasional dance. All this absurdity leads to some truly startling imagery. The broken mirror bleeding, the girl in the clock, the flying severed head biting a woman's backside, the disembodied fingers playing piano - all images now branded on my psyche. At times the film almost ceases to be live action and becomes some kind of animated collage. These techniques would clearly distance any casual movie goer looking for something to be "scary". Scares are normally measured by how far people jump out of their seat, or by how many times they are forced to hide their eyes. For me, horror can and should do so much more than scare or unsettle. House is a movie that rarely builds to a jump scare or features an image anything other than ridiculous because what it is actually trying to do is dissolve reality and place the viewer on a nightmare plain. previous night can often end up with you realising how silly it all sounds. 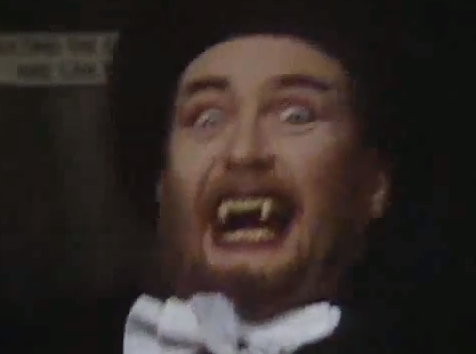 As a child I was tortured in my sleep by Kenny Everett, dressed as Dracula, fighting off stripey-shirted taxi drivers in my garden, or the unyielding pressure of deciding which of the two painted images of soldiers I would send on a mission (a nightmare that lead to me vomiting for realsies). House doesn't necessarily work in nightmare logic but the images it creates are quite possibly the most truly nightmarish I have ever seen. It wears facade as a badge of honour, juxtaposing all manner of images and textures to create dissonance and an unsettling feeling of the uncanny. The production's history is as interesting as the aesthetic on display. With Japanese cinema in decline, partly due to the interest in imported hits, Studio execs were beginning to take risks. TV Ad Director Obayashi was approached and asked to make some thing like Jaws. So, technically, House is the Japanese Jaws. Clearly Obayahsi was less interested in taking cues from Spielberg and instead merged the techniques he'd developed making adverts with his Daughter's whimsical ideas about how scary it would be if their family home began to attack them. 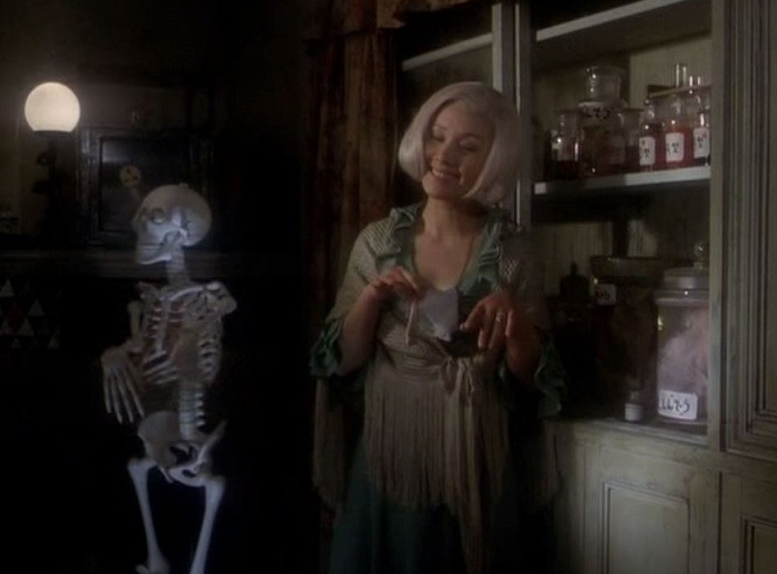 His daughter's various ideas (her reflection bursting out and eating her, getting caught in the gears of a clock, her piano nibbling at her hands) all make it into the film but also go someway into explaining why this film feels like a childhood nightmare. And if you've ever seen Japanese TV ads you will start to recognise some of the techniques used here. 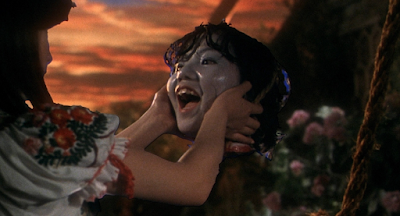 It's not all surface though as Obayashi displays a satirical edge while also being aware of audience reaction (a floating head watches it's body being eaten by a piano and observes "this is obscene"). Despite the bizarre visuals and tonal shifts House is without a doubt a horror movie and one that perfectly captures the kind of nightmares it is almost impossible to explain. It's a macabre pantomime that is arresting, joyous and creepy as hell all at the same time. Ninjas Ninjas Ninjas! A Review of the Year!